Download – FOIA document – An experimental PSychic probe of planet Jupiter. “The Jupiter Probe was one of a number of early experiments designed to try to discover the dimensions and extent of human remote sensing faculties”. 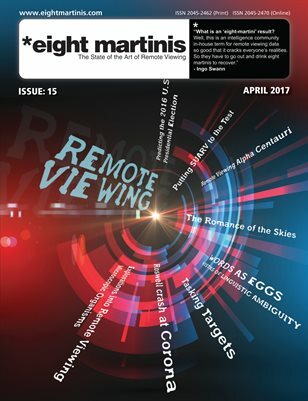 As everyone knows, an amusing but large media flap regarding remote viewing is presently occurring (the 29th one by my count). The flap majorly focuses on a situation involving intelligence community interests in psychoenergetics research that began over twenty-five years ago. Most of the research took place under the excellent auspices of Stanford Research Institute (SRI) now renamed SRI International, the second largest “think tank” in the U.S. The present media flap is distorting the original basis for the early interest in the search for psychoenergetics applications. Because of this, the former director of the project has suggested that complete information now be made available for public access via the Web regarding a series of early psychoenergetic experiments. The former director (always my master, I always his slave) has asked me to begin the public access by entering into the Net the full story of the several experiments. This will be the first of nine other entries to follow. In 1973, mainstream science, academe and media were unequivocally opposed to any kind of parapsychology or psychoenergetics research. It thus came as something of a cultural shock when the nation’s second largest “think tank” undertook that kind of research. The resulting first flap was enormous, largely because of SRI’s high scientific standing and its military and intelligence community affiliations. The Jupiter Probe was one of a number of early experiments designed to try to discover the dimensions and extent of human remote sensing faculties. It was felt that radical experiments should be undertaken in the attempt to establish the dimensions of those faculties. The SRI project’s extremely illustrious sponsors (you know who) concurred. “Several” radical experiments were then designed, and their protocols were examined in advance by a board of noted scientists and overseers. One such radical experiment, the “Jupiter Probe,” took place in 1973 at Stanford Research Institute (SRI) under the excellent auspices of Dr. H.E. Puthoff and Mr. Russell Targ (both esteemed physicists) and other competent scientists of the Radio Physics Laboratory. This particular experiment has occasionally undergone ridicule published in the skeptical media and elsewhere. The following story will reveal that no skeptic has ever read through the details of the experiment. and “not” meant as a “claim” of anything; and knowledge of its illustrious sponsorship and scientific oversight. However, the radical topic of the experiment, remote sensing of the distant planet, brought undue luminosity in a world where marginal Zener card guessing was the standard parapsychology fare. The very idea of the radical topic unnerved not only conventional academic concepts, but conventional parapsychology concepts as well. To record the time it took before impressions began to be given, and (3) to compare the impressions with published scientific feedback. A far-distant target and the expectation of scientific feedback. Technical data and analyses drawn from information telemetered back to Earthbase from NASA spacecraft and which information would be published in scientific media: the Pioneer 10 and 11 “flybys” of 1973 and 1974, and the later Voyager 1 and 2 probes of 1979. April 27, 1973. The first Jupiter bound NASA spacecraft, Pioneer 10, was already enroute to the planet, but yet too far distant to send data back to Earthbase, principally at Jet Propulsion Laboratories (JPL). Two and 1/6th pages of verbal data recorded and transcribed. The raw data needed to be independently guarded so that it could not be said it was altered after the fact. Thirty copies were prepared of the raw data, including statements regarding the purposes and design of the experiment. Three copies were held by the Project’s sponsors. Ten copies of the raw data were offered to scientists noted for their integrity, including two interested astrophysicists then at Jet Propulsion Laboratories. All accepted their copies. One copy each was offered to a noted American astronomer and to a famous science popularizer. Both of these copies were rejected and returned, one with a signed letter of ridicule which resides in my archives. Telephone requests to two noted skeptics to safeguard the raw data were refused. The remainder of the copies were distributed among scientists at SRI and at other places in the Silicon Valley area. One or two of those copies were covertly sold to a San Francisco reporter, and thereafter widely published. The prepared copies were also xeroxed by others and more widely distributed. I have acquired some of these for my archives, and which contain humorous notations on the margins. Before feedback was obtainable, the raw data was broken down by SRI analysts into major data categories, as will be shown ahead. After feedback became possible, no reason was discerned to alter the categories. The categories comprise “all” of the raw data, and nothing was later deleted or added. First scientific and technological feedback sources began becoming available in September, 1973, four months after the experiment took place. Additional feedback sources continued to accumulate by stages up through 1980. The raw data indicate that the viewer had identified a Ring around Jupiter, a sketch of which appears in the raw data (presented ahead) and is also verbally identified. Conventional scientific wisdom held that Jupiter did not possess any Rings. This particular datum was one reason the experiment was laughed out of town by many. The existence of the Ring was discovered and confirmed in early 1979, six years after the Jupiter Probe had taken place. Because the Ring correlated so well with the remote viewing data, a decision was taken by SRI staff to organize all of the raw data, compare it to scientific confirmation sources, and construct a formal report. The raw data comprised only four pages. But the confirmatory data appeared throughout the published scientific and technical articles and papers. It was decided that all of these should be included in their entirety to ensure that no scientific passage was inadvertently used out of context. The feedback data therefore amounted to about 300 pages. The technical references utilized as of 1980 were meant to be representative of then current Jovian research and did not constitute a totally exhaustive scientific periodical collection. Because of this, no “Executive Summary” of the experiment and its results was undertaken. This present document now represents an “informal” summary. Ten original 300-page copies of the formal report were produced. Two copies were immediately stolen from the otherwise secured offices of SRI. It was presumed that this theft was engineered by covert foreign nationals — somewhat irrationally since copies of the report were being freely offered. I retained two copies for my archives, Dr. Puthoff retained one, and one was entered into the Stanford Research Institute library. One copy was unofficially accepted by a ranking NASA official on the understanding that he would deny accepting it if identified. A copy was offered to the leading Skeptical Organization in our fair country. The offer was declined. I don’t know what happened to the remaining copies. Additional xeroxed copies were offered to a number of scientists. Some accepted, but others now declined to take possession of them upon the grounds that no one wanted to possess a document which suggested that a remote viewer had identified Jupiter’s Ring before science had. The formal report of the Jupiter Probe, containing its massive confirmatory data, then descended into obscurity. No one who thereafter mocked the experiment has ever read it or has wanted to read it. A review of the Jupiter Probe was included in “Mind Reach” published in 1977 by H.E. Puthoff and Russell Targ (Delacorte Press/Eleanor Friede) with an Introduction by eminent Dr. Margaret Mead. This in-print 1977 rendering identifies all major categories of the raw data — including the mention of the Ring, two years before it was scientifically discovered in 1979. Additionally, before feedback became possible, the entirety of the Jupiter raw data, or parts thereof, were published in over a hundred media sources world-wide. Mr. Sherman was a noted psychic who had earlier (in the late 1930s) taken part in long-distance viewing between New York City and the Arctic. Those exceedingly successful experiments were undertaken in conjunction with the noted Arctic explorer, Sir Hubert Wilkins (“See”: “Thoughts Through Space” by Sir Hubert Wilkins and Harold M. Sherman, Creative Age Press, New York, 1942). Unfortunately, this significant book regarding long-distance sensing came out during the emergencies of World War II and didn’t achieve the attention it deserved. The reason for inviting Mr. Sherman to participate was to see if two viewers, separated by over 2,000 miles, would report the same or different data. With certain exceptions, the two sets of data corresponded nicely. Mr. Sherman’s contributions were not included in the 1980 formal report because he was not a consultant of SRI and the costs of analyzing his data could not be justified. Immediately below are presented “all” of Swann’s raw data. “Immediately following” the raw data, the different major categories will be found associated to scientific and feedback sources. You may wish at this point to turn directly to the feedback sets which follow the raw data. Although not indicated in the record, the experiment began promptly at 6:00 p.m. PST. The first response occurred at 6:03:25 – perhaps meaning that it took that long “to get to Jupiter,” or that long for images to form. The first data-rich response was not made until just after 6:04:13 – a four minute delay. You will also note that an average delay of 2 minutes occurs between the verbalized data sets. The reason for those delays has not been understood. No big sharp noises for the next 1/2 hour please. 6:03:25 (3 seconds fast) There’s a planet with stripes. 6:04:13 I hope it’s Jupiter. I think that it must have an extremely large hydrogen mantle. If a space probe made contact with that, it would be maybe 80,000 – 120,000 miles out from the planet surface. 6:08:00 Now I’ll go down through. It feels really good there (laugh). I said that before, didn’t I? Inside those cloud layers, those crystal layers, they look beautiful from the outside, from the inside they look like rolling gas clouds – eerie yellow light, rainbows. 6:10:20 I get the impression, thought I don’t see, that it’s liquid. 6:10:55 Then I came through the cloud cover, the surface it looks like sand dunes. They’re made of very large grade crystals so they slide. Tremendous winds sort of like maybe the prevailing winds of earth, but very close to the surface of Jupiter. From that view the horizon looks orangish or rose-colored but overhead it’s kind of greenish-yellow. 6:12:35 If I look to the right there is an enormous mountain range. 6:13:18 If I’m giving a description of where I’ve gone and am, it would be approximately where Alaska is if the sun were directly overhead which it is. The sun looks like it has a green corona, seems smaller to me. (Hal – What color is the sun?) White. 6:14:45 I feel that there’s liquid somewhere. Those mountains are very huge but they still don’t poke up through the crystal cloud cover. You know I had a dream once something like this where the cloud cover was a great arc, sweeps over the entire heaven. Those grains which make that sand orange are quite large. They have a polished surface and they look something like amber or like obsidian but they’re yellowish and not as heavy. The wind blows them, they slide along. 6:16:37 If I turn, the whole thing seems enormously flat. I mean if I get the feeling that if a man stood on those sands I think he would sink into them (laugh); maybe that’s where that liquid feeling comes from. 6:18:10 I see something that looks like a tornado. Is there a thermal inversion here? I bet there is. I bet you that the surface of Jupiter will give a very high infrared count (? ), reading (?) (Hal – reading) (inaudible sentence). The heat is held down. 6:19:55 I seem to be stuck, not moving. I’ll move more towards the equator. I get the impression that that must be a band of crystals similar to the outer ones, kind of bluish. They seem to be sort of in orbit, permanent orbit down through another layer farther down which are like our clouds but moving fast. There’s another area: liquid like water. Looks like it’s got icebergs in it but they’re not icebergs. 6:22:20 Tremendous wind. It’s colder here, maybe it’s because there’s not a thermal inversion there. The atmosphere of Jupiter is very thick. I mean … (Ingo draws) … Explanation of drawing: This is what appears to be a hydrogen mantle about 100,000 miles off the surface. Those here are bands of crystals, kind of elements. They’re pretty close to the surface. And beneath those are layers of clouds or what seem to be prevailing winds. Beneath that is the surface which I saw was, well, it looked like shifting sands made out of some sort of slippery granulated stuff. And off in the distance, I guess, to the East was a very high mountain chain 30,000 feet or so, quite large mountains. I feel these crystals will probably bounce radio waves. They’re that type. I will now present each of the categories by reiterating the raw data statements and give samples from confirmatory sources -although numerous other sources are provided for each category in the formal document. “Scientific American” (September, 1973, p. 121): “Above the hypothetical core is a thick stratum in which hydrogen is by far the most abundant element; this stratum makes up almost all the mass and volume of the planet. The hydrogen is separated into two layers; in both it is liquid, but it is in different physical states. “The inner layer extends from the core to a distance of approximately 45,000 kilometers from the center, where the pressure is estimated to be about three million earth atmospheres … In this layer the hydrogen is in the liquid metallic state, a form of the element that has not yet been observed in the laboratory because it exists only at extremely high pressures. … The outer layer extends to about 70,000 kilometers and consists mainly of liquid hydrogen in its molecular form. “Science”, Vol. 183, Jan. 25, 1974, p. 303: “The Pioneer 10 infrared radiometer has established that the excess radiation is 2 to 2.5 times the solar input and that there is no temperature change at the cloud top levels across the evening terminator of the planet. “Swann”: “Is there a thermal inversion here? I bet there is. “Swann”: “From that view the horizon looks orangish or rose-colored, but overhead it’s kind of greenish-yellow. You know I had a dream once something like this where the cloud cover was a great arc, sweeps over the entire heaven”. “Swann”: I feel that there’s liquid somewhere. If I turn, the whole thing seems enormously flat. I mean if I get the feeling that if a man stood on those sands I think he would sink into them (laugh); maybe that’s where the liquid feeling comes from. “I will now take this opportunity to point out that ALL the skeptical attacks on the Jupiter Probe experiment focus on holding the mountain thing up to ridicule — BUT THAT NONE OF THEM MENTION THE VERY SUCCESSFUL RING THING”. “Science News” (Vol. 110, July 10, 1975): “One of the most famous features of Jupiter’s atmosphere is the great Red Spot. Astronomers have engaged in endless speculation and argument about its nature. Observers have suggested that it was a column of the atmosphere hooked on the top of an extra-high mountain …”. “Scientific American” (March, 1976, p. 53): “Because of the Great Red Spot’s long lifetime, its constancy in latitude and its uniqueness, it seemed that it must be connected with an underlying solid object or topographic feature that was giving rise directly to the flow patterns at the visible surface [cloud cover]. “The Shoemaker-Levy 9 comet impacts on Jupiter”. Not long ago, a series of twenty or so comets impacted Jupiter one after another. The largest of them left “impact craters” so huge and so high that their circular contours can easily be seen emerging from the cloud cover which is several miles thick. Since the impacts, the mountainous craters can still be seen when that side of Jupiter is turned toward earth. 1. “Hydrogen mantle”: Confirmed, September 1973, 1974, 1975. 2. “Storms, wind”: Confirmed (as to dimensions and unexpected intensity) 1976, 1970. 3. “Something like a tornado”. Confirmed (as strong rotating cyclones), 1976. 4. “High infrared reading”. Confirmed, 1974. 5. “Temperature inversion”: Confirmed, 1975. 6. “Cloud color and configuration”: Confirmed, 1979. 7. “Dominant orange color”: Confirmed, 1979. 8. “Water and ice crystals”: Water possible there, but ice crystallization of other elements Confirmed, 1974. 9. “Crystal bands reflect radio probes”. Confirmed, 1975. 10. “Magnetic and electromagnetic Auroras (“Rainbows””): Confirmed, 1979. 11. “The RING”: Confirmed, 1979, not only as to its existence, but as being “inside” the crystallized atmospheric layers. 12. “Liquid composition”: Confirmed, 1973, 1976, as hydrogen in liquid form. 13. “Mountain range (mountains) and solid core”: Probably Confirmed, 1994. Confirmed existence of solid core several tens of masses of earth’s. Recent comet impacts reveal enormous craters extending through thick cloud cover, one approximately the size of 1/2 of the United States. “Science News” (Vol. 106, September 21, 1974, p. 187). “Scientific American” (September, 1975, p. 121). “Time” (September, 1974, p. 83). (b) The second smaller drawing probably refers to the planet’s hydrogen torus, but was not indicated as such in the raw data. “Aviation Week & Space Technology” (June 16, 1979, pp. 16-17, and p. 20. Vol. 115, July 14, 1979, p. 20. The first reactions to the Jupiter Probe experiment were universally negative, including those of the sponsors. The core of the problem was that the raw data included mention of rings and mountains. Prevailing scientific wisdom as of 1973 against the possibility of Jovian rings and mountains and was quite adamant at the time. When it was seen that the viewer’s sketch of the complex atmospheric layers quite nicely matched subsequent scientific renderings, this major data category was accepted as “roughly” evidential. The viewer’s ring and mountains were now thought of imaginary noise entered into a long-distance signal line which was minimally evidential. In any event, experiments were needed with more immediate feedback possibilities, and an enormous number of these were designed and undertaken. These produced more immediate results, and which were used to expand understanding of remote viewing potentials. Had it not been for the fact that stolen copies of the raw data had been leaked to the media, the existence of Experiment #46 might never have publicly surfaced. Neither SRI workers, the sponsors, nor myself ever sought to offer the experiment as “claims” of anything. But now in retrospect, it was fortunate that the thefts took place because the entirety and parts of the raw data early appeared in the media, including “The National Enquirer”. Thus, the raw data was publicly available as of 1974. Experiment #46 lay obscure between 1974 and 1979. No continuing attempt was made to feedback other of its categories, and the SRI work progressed along more immediately fruitful lines. The 1979 scientific discovery and confirmation of the Jovian Ring came as one of the larger shocks and “surprises” in astronomical history. The entirety of the Jupiter Probe raw data was now organized and compared to scientific feedback — after which all of the data, except the mountains, could be seen as near-approximately confirmed. Now, however, the formal report was generally rejected on the grounds that no respectable scientist wanted to be identified as having read it. Yet word got around. Only the mountains remained unconfirmed. When skeptics elected to amuse themselves regarding the Probe it was this single item they focussed on. Additional scientific data achieved since 1980 may either add to or detract from the confirmatory data utilized for the 1980 report. Any Net reader of this document may feel free to contribute additive or detractive data. Such data, however, must be achieved from identified scientific or technological sources and introduced in their entirety with proper identifying references so that others can independently check them out. Any help along these lines would be appreciated. The Jupiter Probe is an historical remote viewing artifact whose documents must stand or fall on their own merits or demerits. Since the history of the SRI project is based on “other” in-depth experiments, whether the Jupiter Probe stands or falls will have no bearing on that history. I presently have no resources to track down scientific and technical articles on the topic of the Shoemaker-Levy 9 impacts on Jupiter, or regarding the craters visible as seen on a recent NOVA TV program.